Search for Manipuri on the internet and you’re going to learn about some herbs and vegetables that are not commonly found in the market. The reason being that Manipuri cuisine depends largely on the seasonal ingredients. Have you heard about jelly ears, water spinach, roselle leaves, bitter beans to name a few? I hadn’t known that they existed till I was reading up on Manipuri Cuisine. Use of hot chillis is common as opposed to garam masala in the Manipuri cuisine. Manipur is known as the Jewelled Land because of its natural beauty. The numerous hills and peaks means that one has to consume food that provides strength and agility. Staple diet consists of rice, vegetables and fish. leafy vegetables are usually grown in their gardens and fish are bred in little ponds. Lots of fresh herbs are added to provide flavor. Kangshoi , a vegetable stew. Eromba, a fish and rice dish. Singju a salad made using banana stems, lotus seeds, banana flower, raw papaya, single leaves along with onions, tomatoes etc. Paaknam, similar to pancakes, its made from the famous ngari fish, steamed in banana leaves. Morok Metpa, a local chutney made from dried green chillis and ngari fish. Alu kanntet – a potato side dish. Nga Tongba – a fish curry. Chahao kheer, a black rice pudding. Finding Manipuri vegetarian dishes on the internet is a task, as there are not that many. However, I didn’t have to look too far. I visited Pushpita’s Blog Pushpita’s Chakhum and found so many traditional Manipuri vegetarian dishes. I got to know Pushpita through a foodie group that we were members of. She had to leave the group due to personal reasons. She is one tough lady, having gone through the challenge of battling cancer, having a baby and running her spreads and pickles business. Visit her blog to find out more about her products which she ships anywhere in the world. I had some black rice in the pantry and asked my partner Shobana Vijay who blogs at Shoba’s Delight if I could use black rice. She immediately agreed and also gave me cardamom as the second ingredient. I gave her soya chunks and onion as her secret ingredients. Shobana’s blog is just the blog to visit if you want a huge collection of South Indian recipes. I used Pushpita’s recipe on Chakhao Poireiton Phirni or Black Rice Phirni as a guideline. Black rice kheer is commonly prepared for community feasts or for ceremonial meals. The phirni was such a delightful dessert which hubby and I enjoyed on our wedding anniversary. Such heavenly taste. I chose to add some almonds, flavored with cardamom and rose essence. You can choose to add other nuts and dried fruits to it. Chakhao is rice in Manipuri language and Poireiton is black. Wash and soak the rice overnight in water. Next day remove the water. Add the rice into a blender along with some milk from the measured amount. Process the rice till it becomes a coarse paste. Add the rice paste along with the remaining milk into a saucepan. Let the milk come to a boil over medium heat. Reduce the heat and let it simmer. Stir the mixture frequently. Simmer it till the rice is cooked. Add condensed milk and almond powder. Mix well. Let it simmer till it becomes thick. Remember to stir it frequently. Add cardamom powder and rose essence. Mix well. Spoon the phirni into individual serving bowls. Put it in the fridge and let it set for 3-4 hours or more. Serve it chilled with almond slivers sprinkled on top. If you want the phirni more sweet then add sugar at step 9. Add dried fruits and other nuts of your choice. To make a vegan version of this dessert, use coconut milk and coconut cream instead of milk and condensed milk. Add sugar according to your taste. Thank you so much Ashima, please do try out the recipe. As for the tea set its a treasure for hubby and me as it was gifted by a very dear friend. She is no more, but we cherish fond memories whenever we use it. Love the gorgeous purple colour of this phirni! The dessert looks divine, and I’m sure it tasted exactly the sane too. Thanks Priya, we loved the phirni. What a lovely and inviting colour. Looks so delectable and tempting. Firni looks so tempting Mayuri. I love the purple colour. I remember my first blog post. It was also a black rice recipe but kheer. You made firni. I will try again following your recipe with ground rice. Lovely share. Thanks Sujata, please try out the phirni, its really creamy and delicious. Oooooooooooooo…… Black rice phirni is an awesome idea. I loved the flavour and texture of black rice, and look forward to trying this recipe. Yes, Pushpita is one tough lady and her blog has helped me discover manipuri cuisine. Thanks Aruna, and totally agree Pushpita is one tough lady. Chakhao Poireiton Phirni – what a mouthful this name is. And so delightfully strange. Just as cooking Manipuri has been! I make black rice salads once in a while but my favourite use of the grain is the Black Rice Kheer with dried apricots and vanilla extract. The Black Rice phirni would have a totally different texture because the rice Is blended with milk and then cooked. A lovely new addition to the possible desserts I can wow my grandchildren with, when we next meet! Though the name is a mouthful,It definitely is a ‘wow’ dessert. I’m sure your grandchildren will be delighted. I agree with you. Pushpits’s blog is a treasure house of recipes. This pudding looks so good Mayuri. I am amazed at the rich colour of the pudding. Thank you so much Veena, I feel there is some difference in the black rice quality that is available in India and Indonesia. Mine is from Indonesia. Wow, love the colour of the kheer and it looks absolutely delicious. Beautiful clicks. Since Black Rice is a tad heavier to consume, making a phirni is a clever idea. The thing that attracts me most is that colour (courtesy rice) and the rose essence that you have added. Must have been one flavourful dessert. The post will surely encourage everyone to try this once. Thank you so much Vidya. I would definitely make it again as its so different from the normal phirnis. Deep purple color of the Phirni is so inviting and are absolute feast for our eyes. Also these look so thick and creamy. I am sure everyone will enjoy these chilled Phirnis for sure. Thank you so much Anu, the colour is from the rice. Pushpita is so inspiring di and there is so much one can learn from her and her blog. The gorgeous color of the black rice phirni is tempting me to hunt for black rice and try this creamy and flavorful dessert for myself. Bookmarking the recipe. Thanks Poonam, the color is entirely from the rice. Pushpita is truly an inspiration to so many as she has weathered a great storm in her life. A very inviting phirni and love the colour the rice has imparted to it. Beautiful clicks. I am still not used black rice . The phirni using black rice looks so delicious. Love the deep purple hue here. I love rice pudding and phirni , but I have never considered making it with black rice. It certainly looks really pretty. Is there a difference in flavour compared to one cooked with white rice?? Thanks Nayna and yes it does taste a little different. Black rice has an earthy taste. Love the ingredients in this dish. Looks delicious! 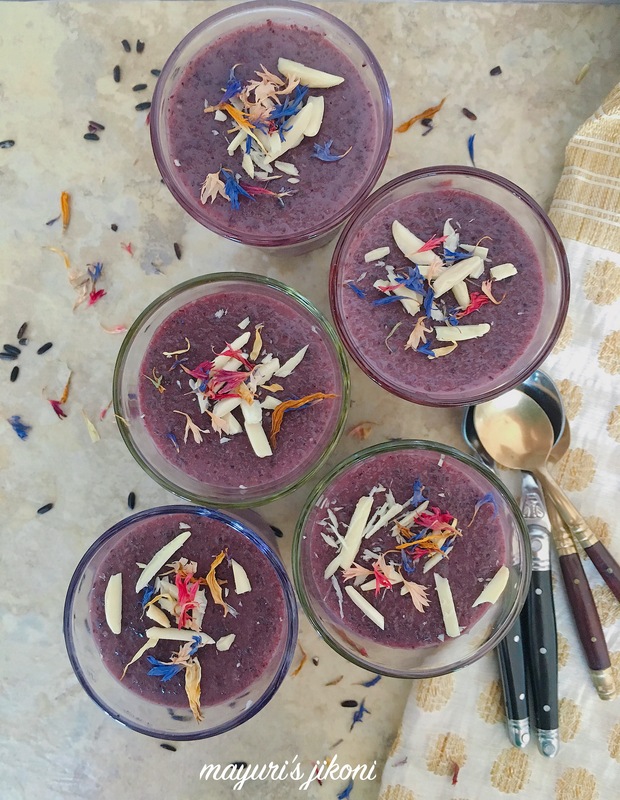 Black rice phirni looks delicious and so creamy. Love the color and the texture.. never tried black rice, will soon try now. Thanks Swati, its tasty and easy to make. Try it.